ProKrete cementitious urethane (CU) products have been researched and developed for nearly three decades of hands on experience with both installer and end-user. This ProREZ CU product line offers better flow, leveling, longer working time, and quicker return to service when compared to other urethane cement systems in today’s market. Cementitious urethane has been time-tested to outperform the traditional epoxy mortar system. It combines the strength of concrete, urethane, and urea for the most durable, versatile, reliable, and self-priming functional flooring system in its class. Cementitious urethane is an ideal product to install in areas that are subject to hot and cold thermal cycling due to the product having similar thermal coefficient of expansion to concrete. This physical property inherent to the material avoids stress from linear deformation that typically affects the bond strength of other floor coatings. Also, the impact resistance of these floors causes the floor to deform rather than crack by distributing the impact loading throughout the system unlike quarry tile, acid brick, and other resinous systems. Meeting USDA, FDA, & CFIA Standards, our ProKrete systems are particularly popular in commercial kitchens as well as food & beverage processing facilities for their thermal cycling & shock resistance, as well as their quick returns to service. Their excellent moisture vapor tolerance, adhesion, chemical, acid, alkali, and impact resistance also make these systems practical solutions for many industrial, commercial and institutional floor coating applications. From 1/16”-3/8” or greater in thickness- from our highly functional self-leveling ProKrete SL or SLB, or our heavy duty, one-step troweled-applied ProKrete HD/RT to our next generation FlexKrete SLR (rubber granule) and SLF (polymer flake) broadcast hybrids with integral cove base, these systems offer real versatility in protective floor resurfacing while supporting environmental concerns with their use of renewable resources. Microbe◊BLOK, a factory installed antimicrobial film preservative is also available when hygiene & sanitation are critical considerations. Like all of the ProREZ coating materials, the cementitious urethanes can be field-tinted with our colorfast, stable ProColor Universal Colorants, or ProColor CU (cementitious urethane colorant) for a more cost-effective method of tinting your product. ProKrete System is a low odor, zero VOC, 3-component, pigmented cementitious urethane. It provides variable thickness ranging from a roller-applied thin set of 5 mils up to a 1/2” finished trowelable system. 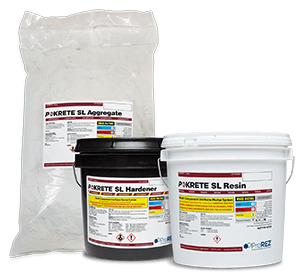 ProKrete is designed to withstand aggressive chemical and thermal attack thus providing superior functionality and longevity when properly applied. Reference technical data sheet for more information. 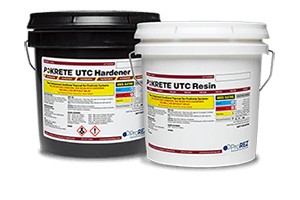 ProKrete UTC is a low odor, 100% solids, chemical resistant urethane coating designed to be used as a pigmented grout and finish coat over ProKrete Cementitious Urethane systems. ProKrete UTC is formulated specifically for application in food & beverage processing environments where its semi-flexible design, chemical and thermal shock resistance make it a tougher alternative to a 3-component urethane topcoat. 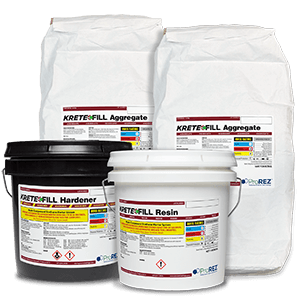 Reference technical data sheet for more information..
KreteFill is a low odor, 3-component, urethane concrete mortar used for sloping, and patching/repair applications in place of regular epoxy-based materials. This trowel-applied mortar provides an excellent underlayment, and is especially well suited for all food and beverage environments where damp or high moisture levels in concrete are present or chemical areas where degradation of the concrete has taken place and a chemical resistant repair mortar is required. Reference technical data sheet for more information. ProCrete CM is a low odor, 3-component, urethane concrete mortar used for cove base applications in place of regular epoxy-based materials. This trowel-applied mortar provides an excellent base material, and is especially well suited for al food and beverage environments where damp or high moisture levels in the substrate are typically present. Reference technical data sheet for more information. 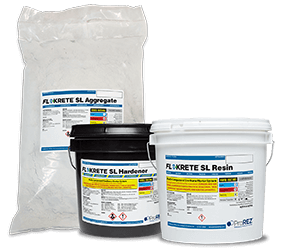 FlexKrete SL is a flexible, self-leveling, 3-component urethane polymer concrete containing rapidly renewable material. When properly applied, FlexKrete SL is designed with good viscoelasticity while remaining tough and capable of withstanding aggressive chemical, impact, and thermal exposures. At 1/8”-1/4” in thickness, this self-leveling system offers good pliability and excellent durability for traffic bearing surfaces. Reference technical data sheet for more information.